There’s nothing like a wren on a cold, blustery winter’s day to teach a quick lesson in the resilient spirit shared by all our fine feathered friends. Photo by Jean Potter The Winter Wren often skulks near the ground in a manner more in a keeping with a small rodent rather than a bird. Although not particularly suited to cold temperatures, wrens don’t seem bothered too badly when the mercury sinks in the thermometer. These tiny bundles of feathers move like hyper-active dynamos as they explore tangles of vines or the nooks and crannies of a dark garage as part of their almost constant foraging for food. Photo by U.S. 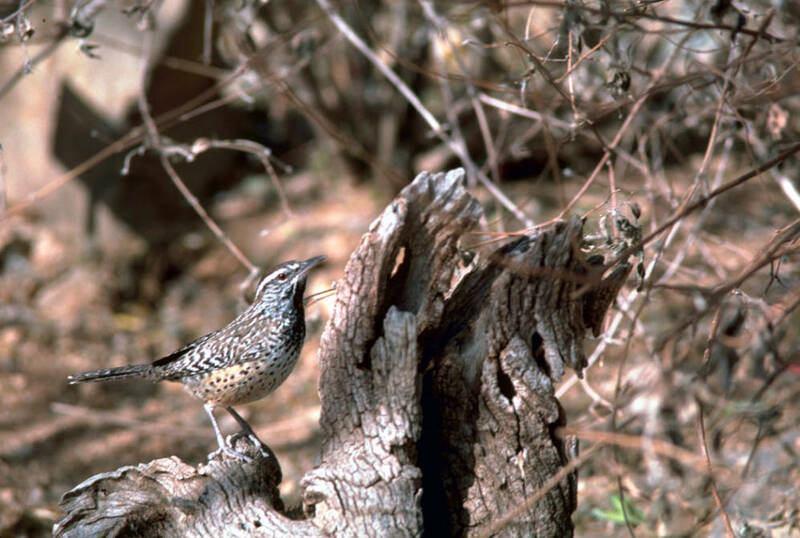 Fish & Wildlife Service The Cactus Wren is a specialist of arid habitats in the American Southwest. At first glance, many people might be tempted to lump wrens together with the sparrows, or “little brown birds.” There are some key differences and, as with sparrows, there are several different species of wrens. Wrens are (almost) an exclusively New World family of birds with the single exception of the bird that Americans refer to as the winter wren. Across Europe, the same bird is known simply as “wren” and is the only member of the family to occur outside of the New World. 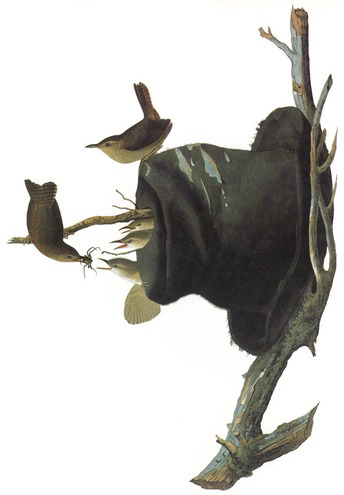 John James Audubon painted House Wrens nesting in an old hat. These small wrens are cavity-nesting birds that choose some surprising nesting locations. Known by the scientific name of Troglodytes hiemalis, roughly translated as “wintry cave-dweller,” the winter wren is a tiny North American bird and a member of the mainly New World wren family Troglodytidae. The “cave-dwelling” description comes from this bird’s habit of skulking near the ground where it explores nooks, crannies and crevices in search of food. In our region, the tiny winter wren is most likely to be encountered during the winter months although the species is a nesting bird on some of our higher mountains. Those intending to spend the winter at lower elevations in the region usually arrive in October and depart in early spring. Photo by Jean Potter House Wrens will defend nesting locations from other birds, at times even destroying the eggs or nestlings of other birds. About the time the winter wren departs, however, a related bird — the house wren — arrives in the region in time for the nesting season. House wrens are native birds, but they often fail to win favor because of their habits of damaging the nests of other cavity-nesting birds such as Eastern bluebirds and Carolina chickadees. Eastman, a wildlife biologist and naturalist, outlined in his chapter on the house wren the territorial nature of the bird. Not only will house wrens puncture the eggs of other birds, they will also kill young birds that are still confined to the nest. 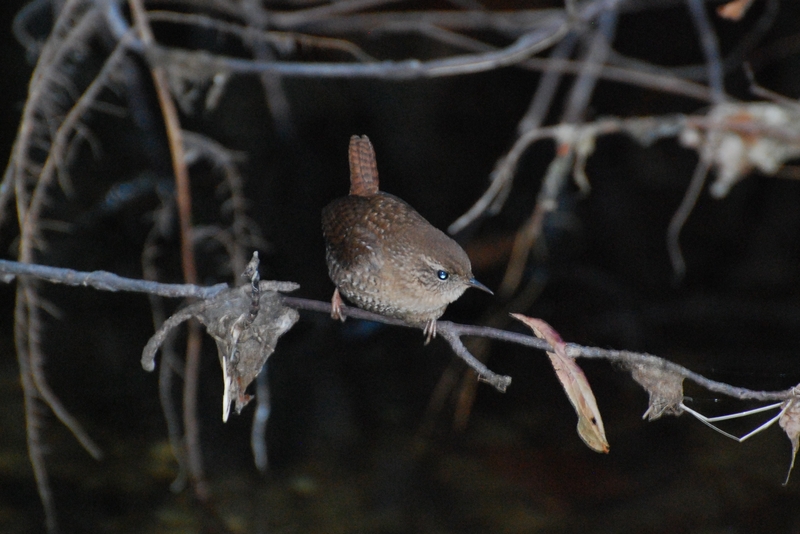 Once a pair of house wrens adopts a nesting site, they may remain loyal to it for many years. 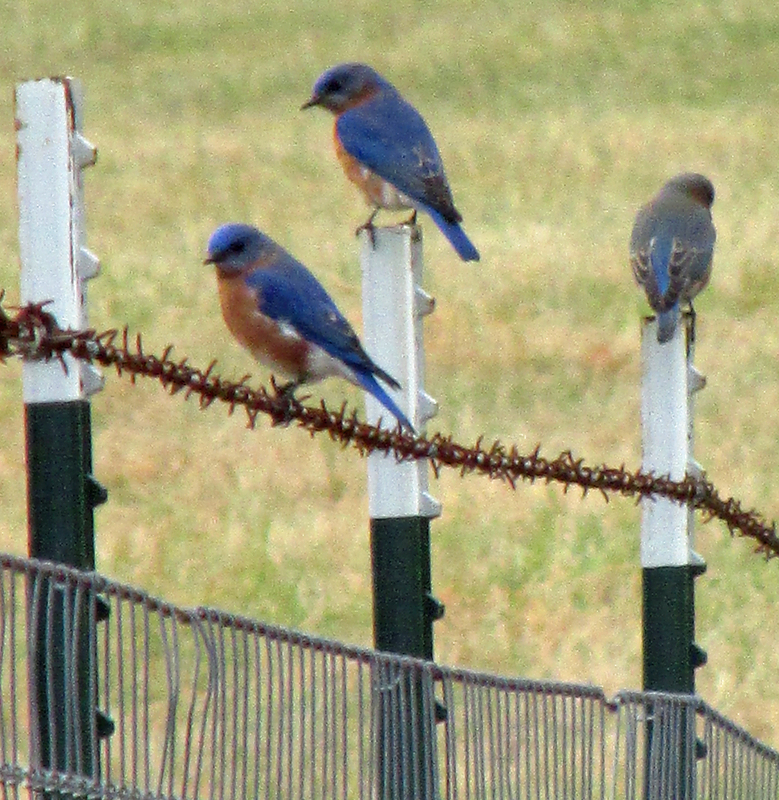 According to Eastman, these tiny birds display a powerful fidelity to nesting locations from previous seasons. Photo by U.S. Fish & Wildlife Service A Marsh Wren delivers insects for hungry young in a nest built in a wetland area. 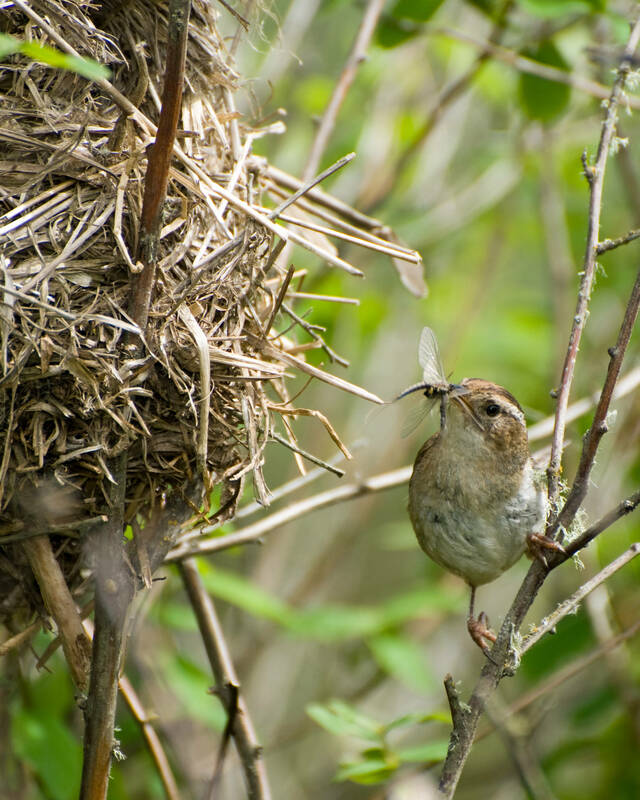 The male house wren will also build several “dummy” nests in his territory, but these nests must be approved by the female. Once she makes her selection, she will line the nest with softer materials and then lay her six to eight eggs. Other wrens in the United States include Bewick’s wren, rock wren, cactus wren, marsh wren and sedge wren. Several of these wrens are more specialized than the wrens found locally. The marsh and sedge wrens are fond of wetland habitats, while the rock and cactus wrens of the western United States make their home in dry, arid environments. For most residents of Southwest Virginia and Northeast Tennessee, the most common wren is the Carolina wren. 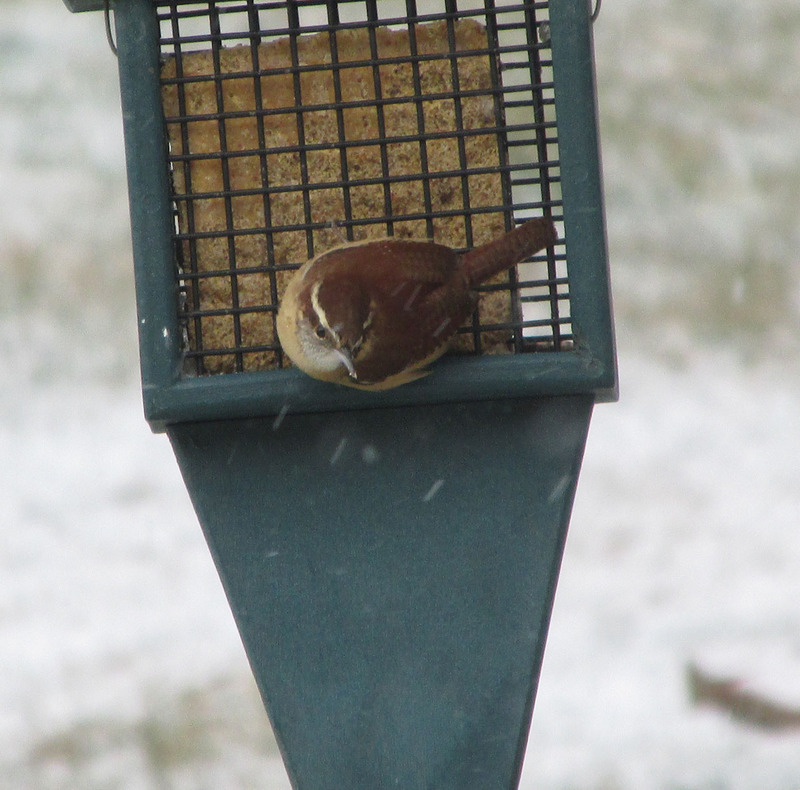 I’ve had good luck attracting Carolina wrens to my feeders by offering fare such as suet and shelled, unsalted peanuts. This wren will also feed on sunflower seeds if other birds have completed the task of hulling the kernel from inside the shell. One of my earliest introductions to a nesting bird took place many years ago when I was a boy. A small brown bird had claimed a cloth bag hanging on a hook on the back porch at the home of my grandparents. My grandmother used the bag to hold her clothes-pins. My grandmother had to make some adjustments to her laundry routine while the bird raised a family of young. Photo by Bryan Stevens Carolina Wrens will visit feeders for a meal of suet, peanuts or other fare. 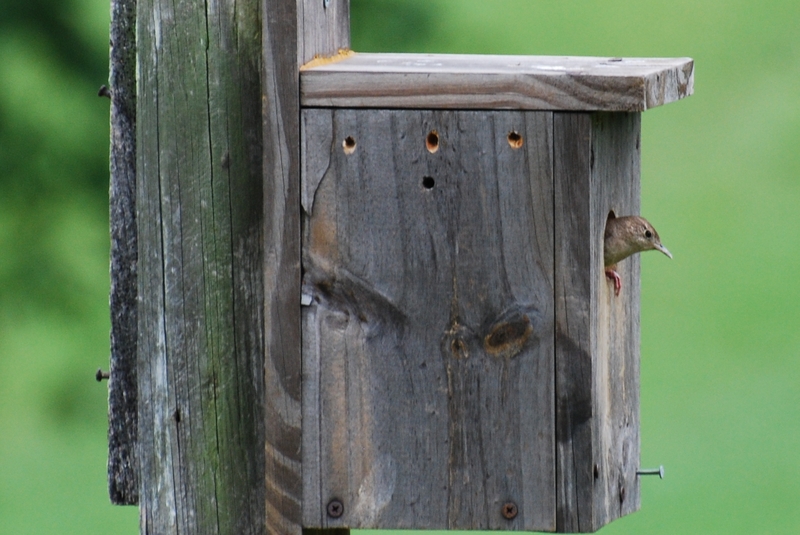 I now realize the bird was most likely a Carolina wren. These birds are known to choose some unusual nesting locations, including mailboxes, overturned flower pots and even old boots. A friend of mine shared a story and photos of a Carolina wren that built a nest in her plastic Halloween pumpkin inside a storage shed. This wren was once considered an almost exclusive southern species, but it has been steadily expanding its range northward for more than a century. 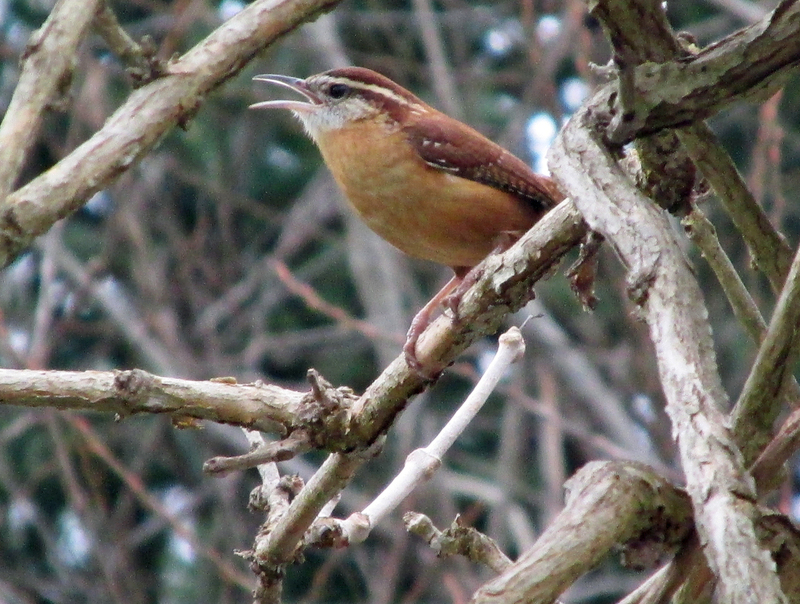 The Carolina wren has served as the official state bird of South Carolina since 1948. The wren took the place of the former state bird, the Northern mockingbird. The same state act that elevated the Carolina wren to its official status also made it a misdemeanor to intentionally kill a Carolina wren (or mockingbird) that is punishable with a $100 fine or a 30-day sentence of imprisonment. 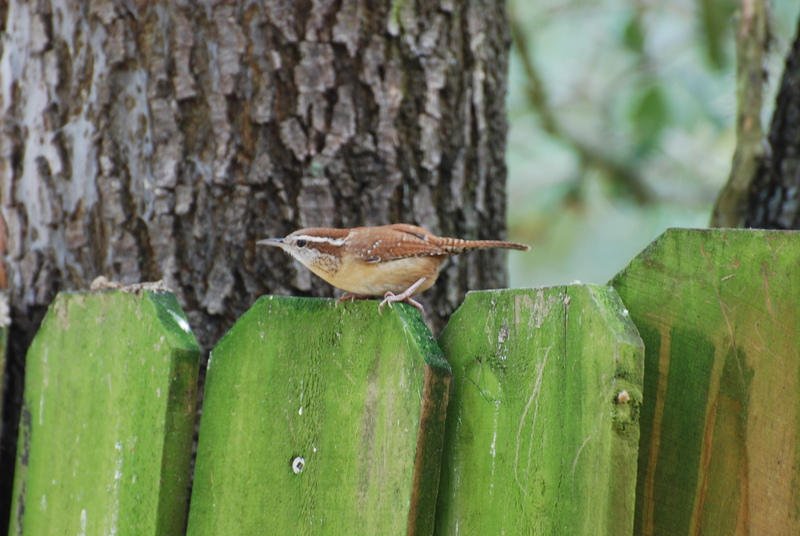 Photo by Jean Potter A Carolina Wren creeps along a picket fence. This wren is a common bird in many gardens and yards. This entry was posted in Birding, Birds and tagged Birding, Bristol Herald Courier, Carolina Wren, Carolina Wrens, Carter County Compass, Elizabethton Star, Erwin Record, House Wren, Our Fine Feathered Friends, The Erwin Record, Winter Wren, Wrens on January 25, 2015 by Bryan Stevens. Photo Courtesy of Faye Guinn The Rufous Hummingbird is shown visiting a feeder at the Guinn home. The hummingbird that had been at the home of Howard and Faye Guinn since October departed on Dec. 23. Faye informed me of the bird’s departure in an email. He also informed me that wintering hummingbirds are not a phenomenon exclusive to the United States. 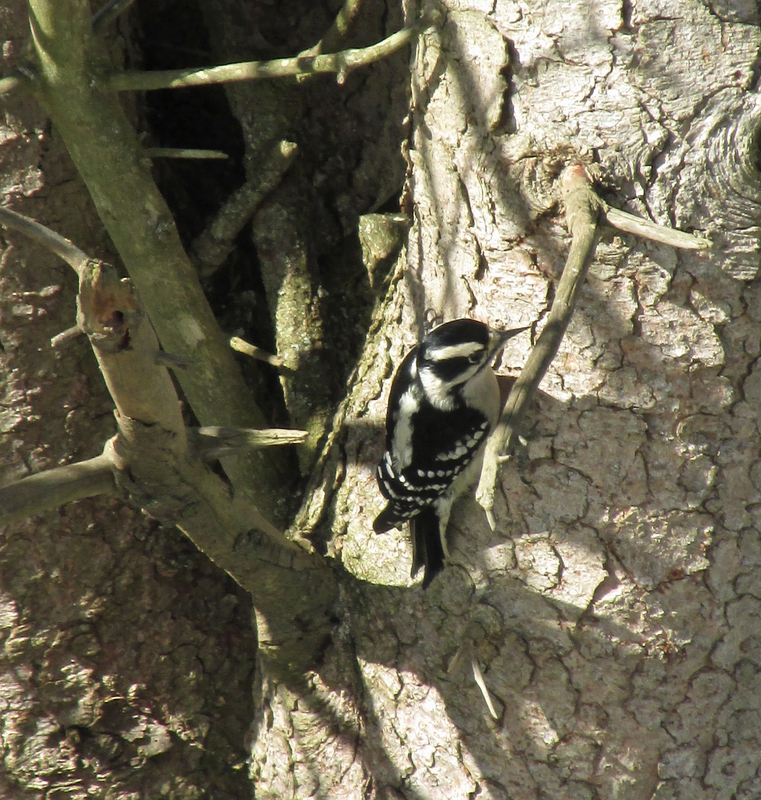 Some of these tiny birds also spend time north of the border during the winter months. While Vancouver is a rather temperate city, Oscar said the temperature can get cool on some days. In my reply, I did note that hummingbirds are usually quite territorial. Any readers who hosts more than one hummingbird at a time is probably familiar with the chasing antics Oscar described in his email. Photo by U.S. Fish and Wildlife Service An Anna’s Hummingbird perches on a branch. I did some research, which informed me that Oscar’s visiting hummingbirds are likely Anna’s hummingbirds. 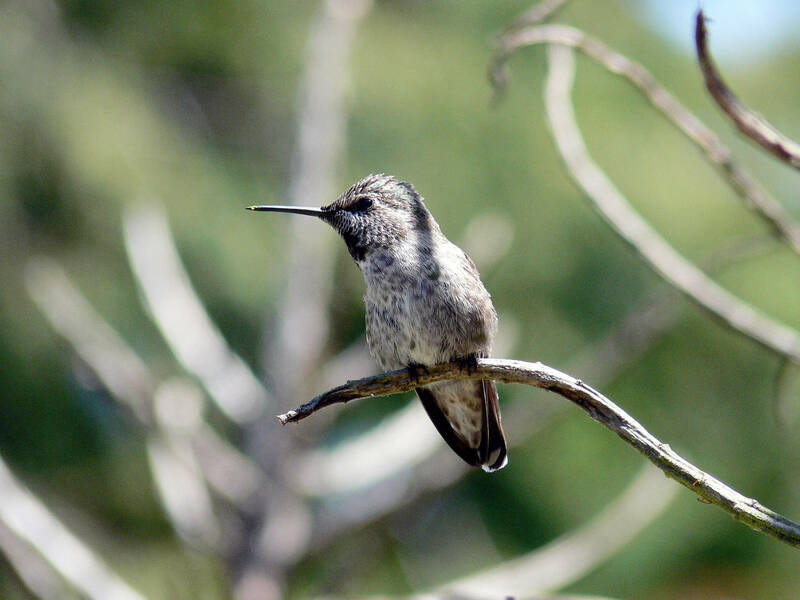 hummingbird is a year-round resident of the Pacific Coast. It ranges from northern Baja to points as far north as Vancouver and southern British Columbia. Photo by U.S. Fish and Wildlife Service A male Anna’s Hummingbird spreads it wings while settling onto a perch. René Primevère Lesson, a French ornithologist and author of a manual for ornithology, gave the Anna’s Hummingbird its name. This bird was named after Anna Masséna, Duchess of Rivoli. She served as an attendant for Empress Eugenie, the wife of Napoleon III and the last Empress consort of the French. Another hummingbird — the Magnificent Hummingbird — was also named by Lesson to honor François Victor Masséna, the Duke of Rivoli and husband of the Duchess Anna. 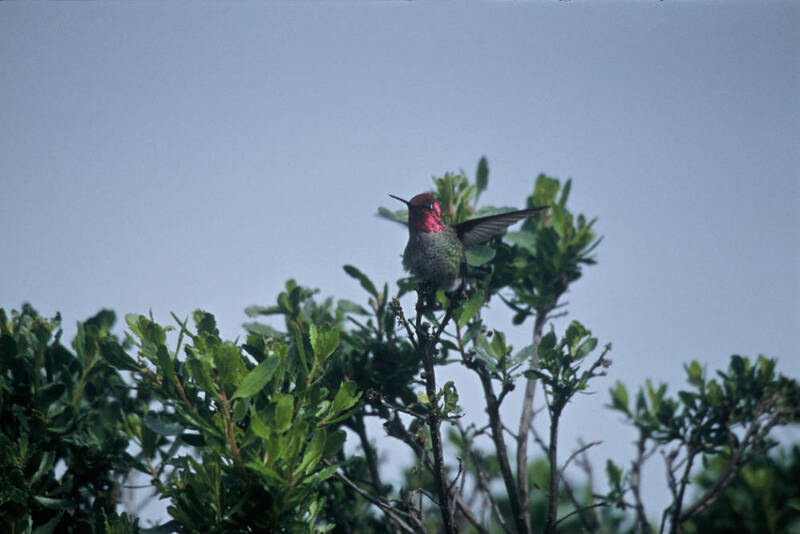 Until the 1980s this large hummingbird was known as Rivoli’s Hummingbird. In the early 20th century, Anna’s hummingbird bred only in northern Baja California and southern California. Modern landscaping techniques, including the planting of exotic shrubs and flowers, has helped this hummingbird expand its range north, especially in urban and suburban areas. 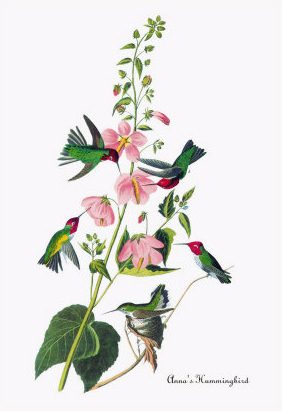 Early naturalist John James Audubon created this painting of Anna’s Hummingbirds. Until the recent cold snap, it has been a relatively mild winter. Even the Arctic blast produced mostly cold and very little in the way of snow. 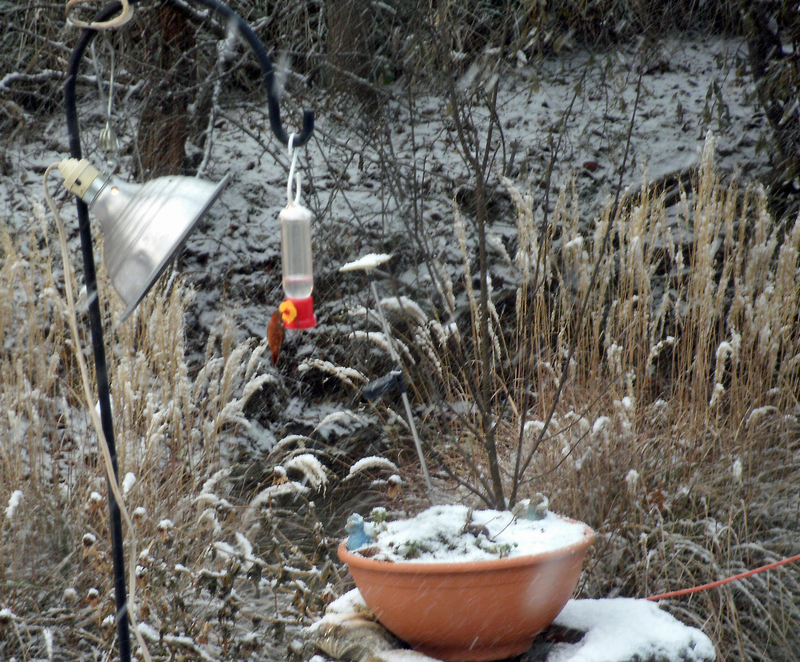 The frigid conditions did, not surprisingly, result in increased traffic at my feeders. 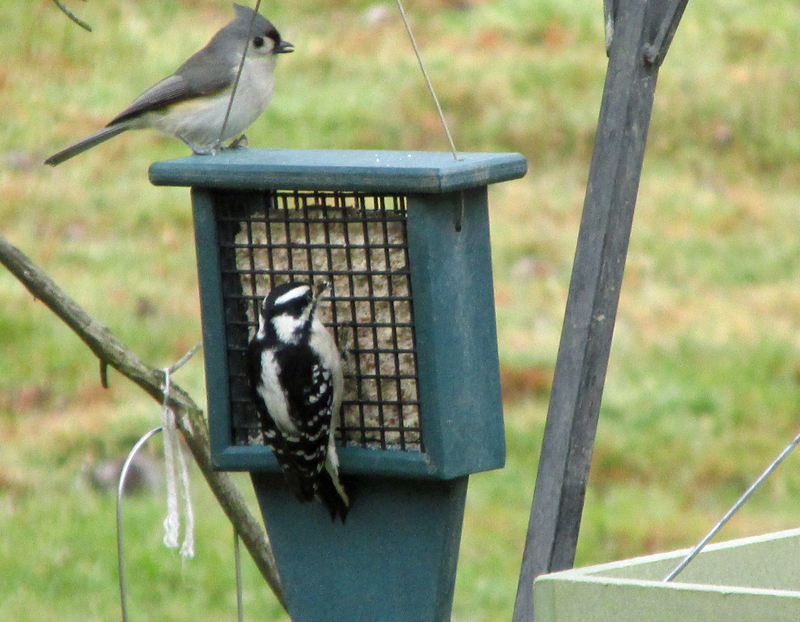 Photo by Bryan Stevens A Tufted Titmouse and Downy Woodpecker visit a suet feeder. I haven’t hosted any birds as exotic as an Anna’s Hummingbird this winter, but the flocks of Pine Siskins and Purple Finches continue to grow. 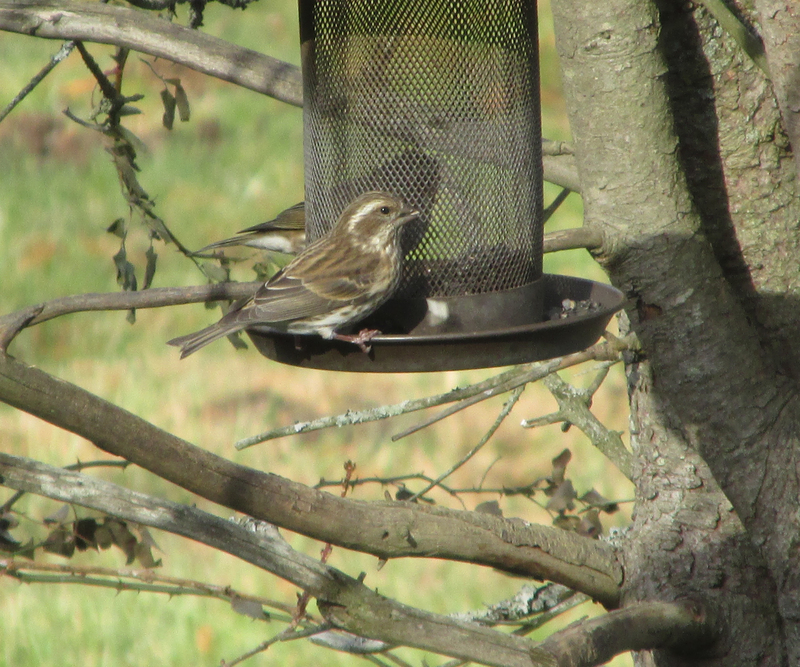 The arrival of January has seen as many as 25 Pine Siskins and about a dozen Purple Finches at my feeders. I always offer suet cakes as well as seeds, an offering that seems much appreciated by birds as diverse as Carolina Chickadees and Downy Woodpeckers to Carolina Wrens and Blue Jays. 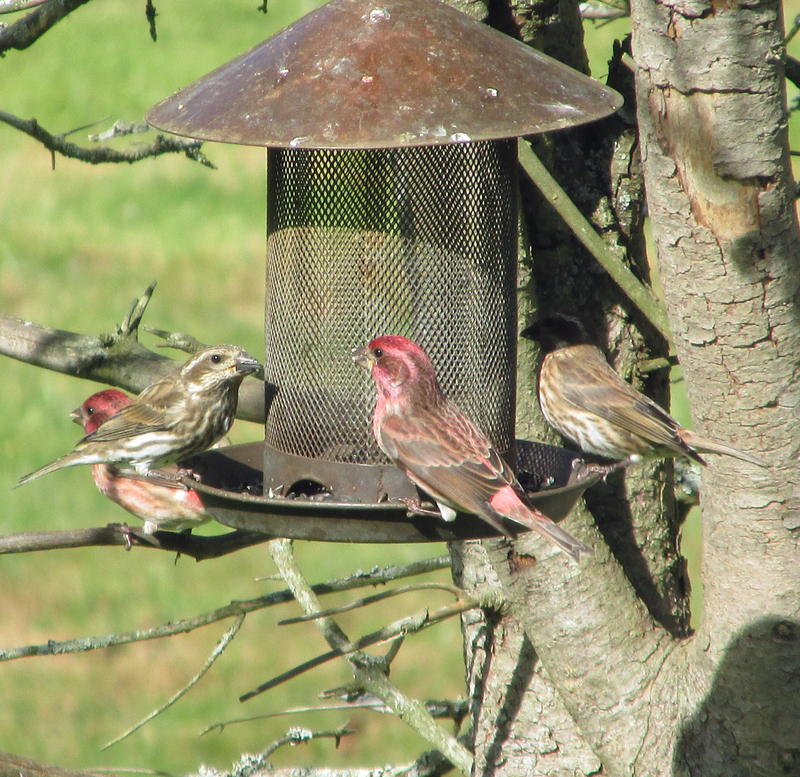 I usually buy commercially prepared suet/peanut butter cakes, which disappear quickly once the birds find them. The occasional squirrel also helps with making short work of them. 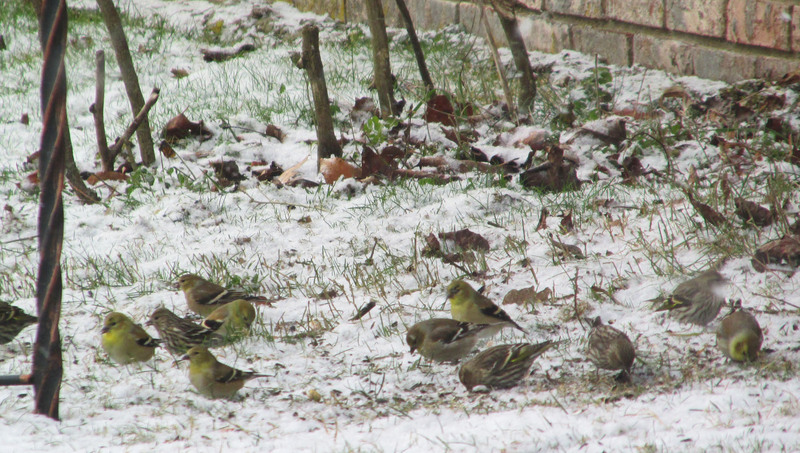 Photo by Bryan Stevens A mixed flock of American Goldfinches and Pine Siskins scour the ground beneath a feeder. This entry was posted in Birding, Birds, Hummingbirds and tagged Birding, birds, Bristol Herald Courier, Carter County Compass, Elizabethton Star, Erwin Record, Hummingbirds, Our Fine Feathered Friends, Pine Siskin, Purple Finch on January 11, 2015 by Bryan Stevens. The first day of 2015 produced some excitement in the yard here on Simerly Creek Road. 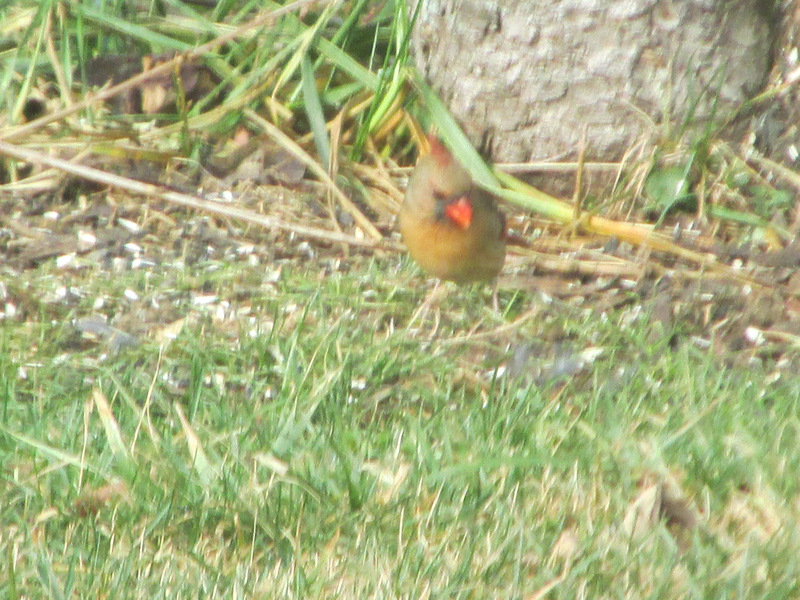 I was watching a female Northern Cardinal — the first cardinal I had observed in the new year — as she foraged on the ground beneath one of the feeders. I even used my camera to take a few photos of her through the window. Photo by Bryan Stevens A female Northern Cardinal foraging on the ground beneath a feeder. I was getting ready to snap another picture when an intruder violently inserted itself into the scene, scattering other birds at the feeders. Everything happened so quickly I needed an instant to figure out what was happening. Photo by Bryan Stevens The visiting Sharp-shinned Hawk is pictured only seconds after capturing the cardinal in its talons. A pair of spread wings eventually transformed into a full bird as my brain identified the intruder as an adult Sharp-shinned Hawk — and one that had just captured itself a meal, albeit at the expense of the cardinal. With the cardinal secured in its talons, the hawk looked ready to consume its prey when an American Crow flew to a tree and perched overhead making its displeasure with the hawk very clear. The hawk hesitated and then took off, taking its prey with it and leaving with such velocity that it left the protesting crow far behind. Photo by Bryan Stevens The Sharp-shinned Hawk is a stealthy, efficient and determined predator. 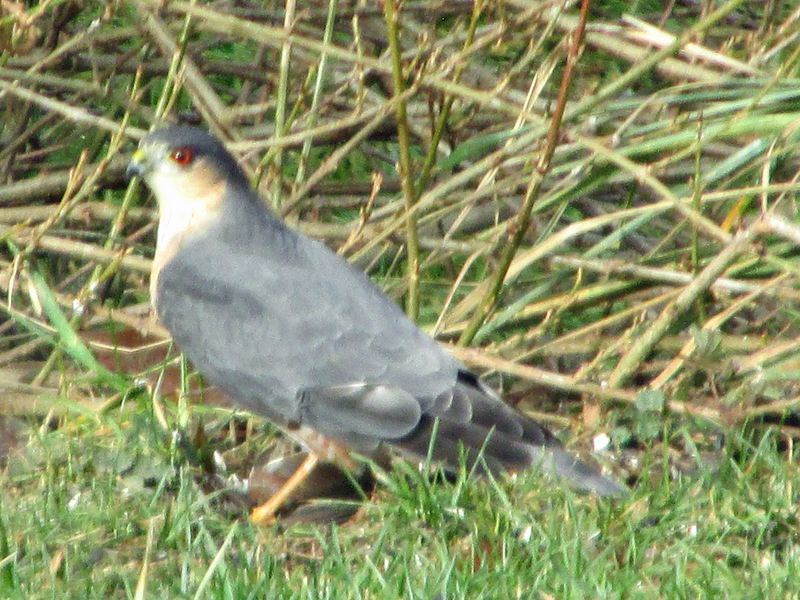 The Sharp-shinned Hawk became one of the first birds on a yard list I will be keeping in 2015. A couple of years ago I did a list of all the species of birds I observed in the five-county area of Northeast Tennessee. Such a list is fun to compile, but it takes a lot of dedication. 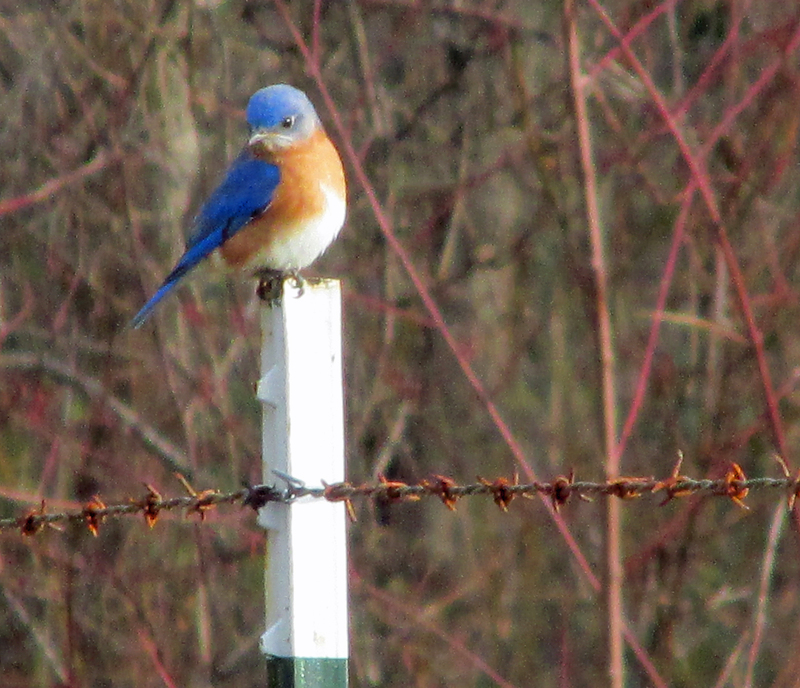 I figure counting the birds that make an appearance in my yard from Jan. 1 to Dec. 31 in 2015 is a more feasible goal. Photo by Bryan Stevens The Sharp-shinned Hawk is a small raptor, often described as similar in size to a dove. In addition to the Sharp-shinned Hawk, Northern Cardinal and American Crow, the other birds I’ve already added to my 2015 yard list are Mourning Dove, Great Horned Owl, Downy Woodpecker, Pileated Woodpecker, Blue Jay, Tufted Titmouse, Carolina Chickadee, White-breasted Nuthatch, Carolina Wren, Eastern Bluebird, Eastern Towhee, Song Sparrow, White-throated Sparrow, Dark-eyed Junco, Purple Finch, House Finch, Pine Siskin and American Goldfinch. That’s more than 20 species and the year is not yet a week old. 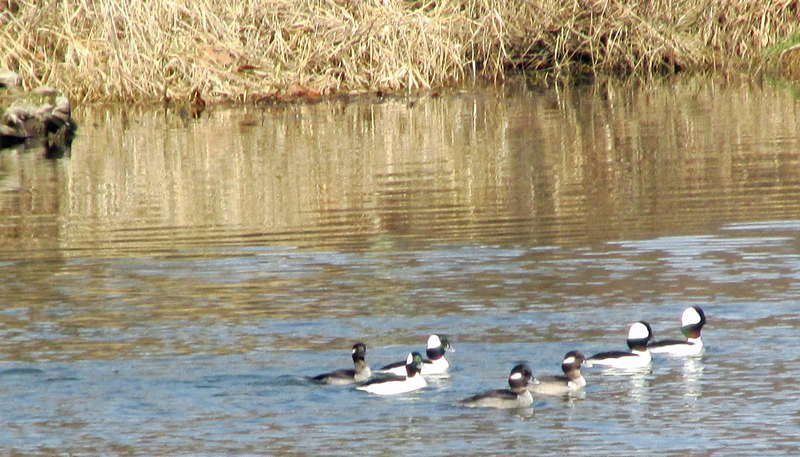 My goal is to find at least 100 species in 2015. The tally will probably proceed slowly, but I will provide regular updates as I add new species to the list. Photo Courtesy of Jean Potter An immature Sharp-shinned Hawk perches on a limb. These raptors often ambush their prey. The Sharp-shinned Hawk and its larger relative, the Cooper’s Hawk, are the two raptors most often encountered by people who feed birds. Part of the family of Accipiter hawks, these two species are widespread in woodlands. The Cooper’s Hawk is larger, often described as similar in size to an American Crow. The Sharp-shinned, on the other hand, is usually described as the size of a dove. There’s some overlap in size, so it is not the only reliable means of identifying these hawks. 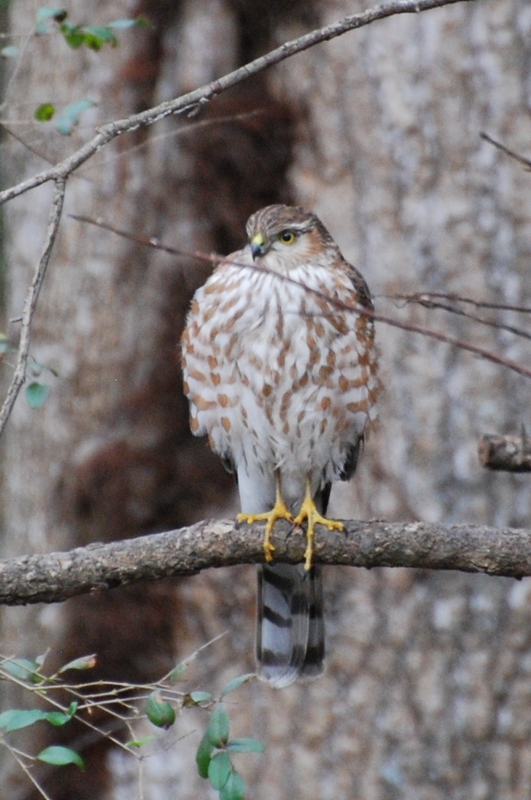 For example, female Sharp-shinned Hawks are roughly equivalent in size to a male Cooper’s Hawk. As with many raptors, the female is larger than the male in both these species. There are some other things to look for in telling these species apart. 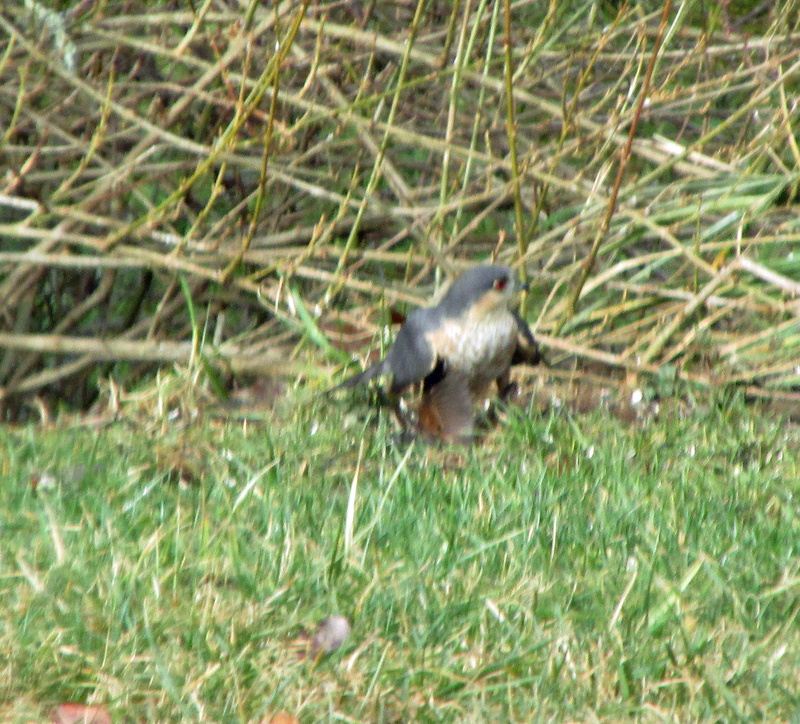 For instance, adult Sharp-shinned Hawks often look like they have a dark cap or hood. The eyes on a Sharp-shinned Hawk also look like they are halfway between the front and back of the head. In addition, the head itself looks small in comparison to the overall size of this hawk’s body. 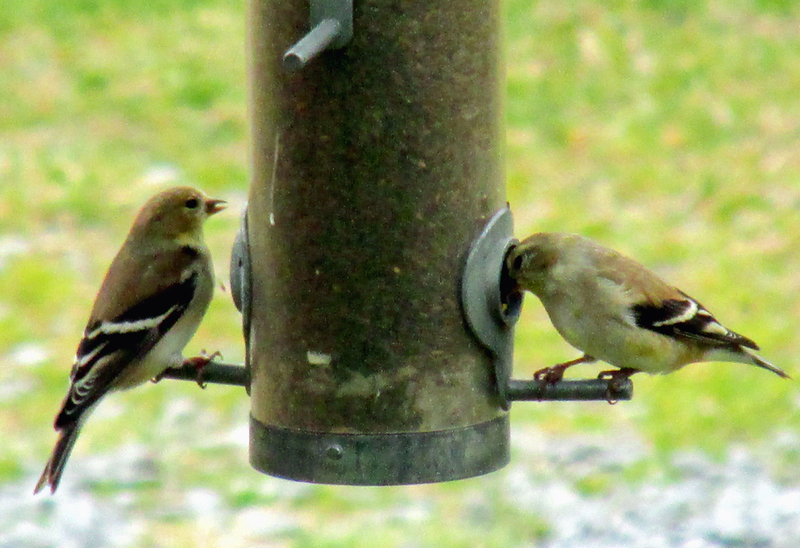 These two species feed heavily on songbirds, which causes some bird-lovers distress. When I posted photos of the incident with the cardinal and hawk to my Facebook page, a few friends were definitely upset that the cardinal’s stay in 2015 proved so brief. I like to view these incidents as good examples of proper balance in the natural world. The Sharp-shinned is really beautiful, especially for a hawk. Preying on songbirds doesn’t make them “bad” birds. They’re doing exactly what nature intends for them to do. 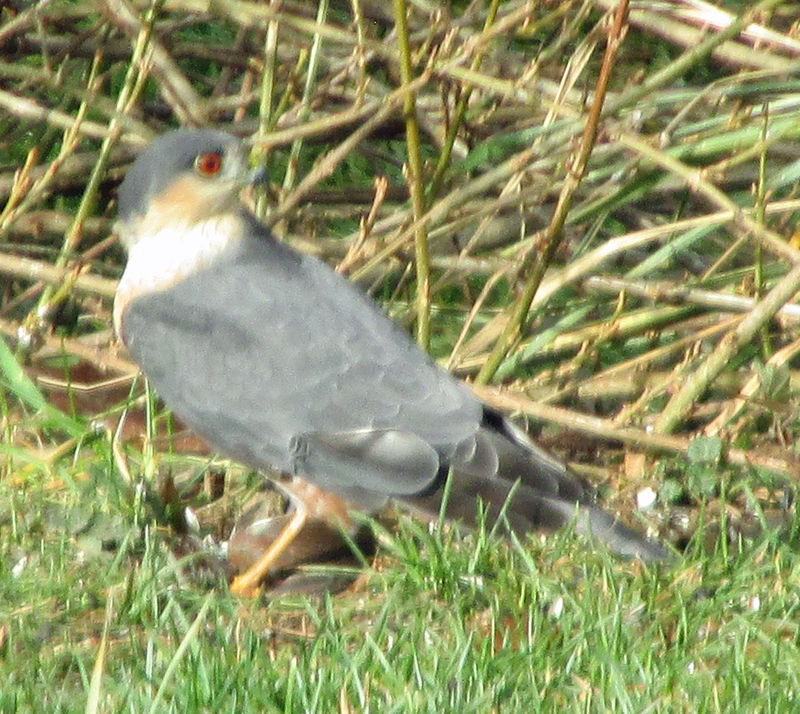 They’re extremely efficient predators, and I was impressed by both the power and precision deployed by the Sharp-shinned Hawk in capturing the unfortunate cardinal. In case you’re worried about the cardinal population, later that same day a flock of about a dozen cardinals visited my feeders about a half hour before dusk. Predatory hawks are part of the balance in nature. It’s a balance that we should strive not to upset. 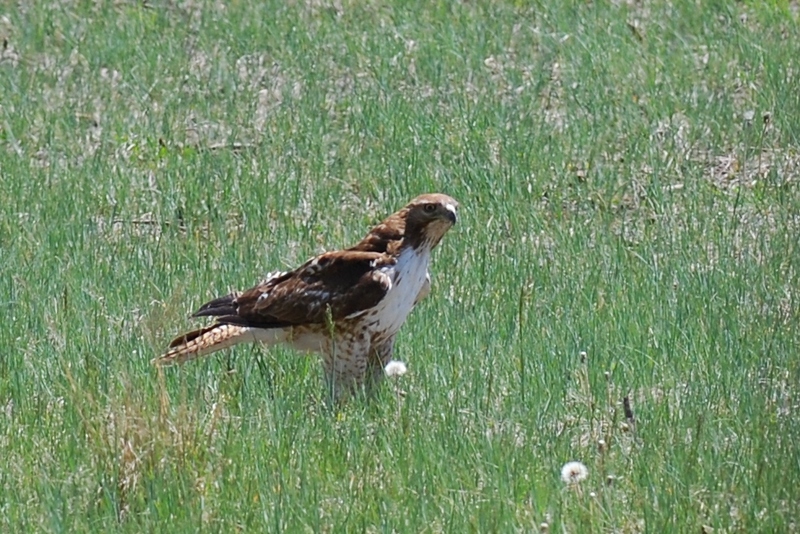 Photo Courtesy of Jean Potter A Red-tailed Hawk is shown standing in a field. In the past few days, I have seen Red-tailed Hawk, Great Horned Owl and Cooper’s Hawk here at home (or within a few miles of my home) and I take that as a good sign. The absence of predators can be a sign that something’s wrong with the food chain. If the chain gets broken, everything (prey and predators) will suffer. The Accipiter genus of hawks includes about 50 species. In Northeast Tennessee, as well as across much of North America, the two common species are Sharp-shinned Hawk and Cooper’s Hawk. A third species, the Northern Goshawk, is a rare visitor to the region. The Northern Goshawk is a large, powerful hawk, and it is also fiercely defensive of its nest. This hawk is known to attack other raptors, mammals and even humans that stray too close to its nesting site. Goshawk is a term derived from “goose hawk,” referring to the ability of this bird when utilized in falconry to take down such large prey as geese. Other Accipiter hawks around the world include Spot-tailed Sparrowhawk, Rufous-chested Sparrowhawk, Grey-headed Goshawk, Semi-collared Hawk and Tiny Hawk, which is one of the world’s smallest raptors. This diminutive hawk is about the size of a European Starling and lives in Central and South America. The Sharp-shinned Hawk will feed on a variety of birds, ranging in size from sparrows, warblers and thrushes to birds as large as Ruffed Grouse and Mourning Dove. This hawk also feeds on small mammals, reptiles and insects. Photo by Bryan Stevens A flock of American Crows mobs a perched Red-tailed Hawk. 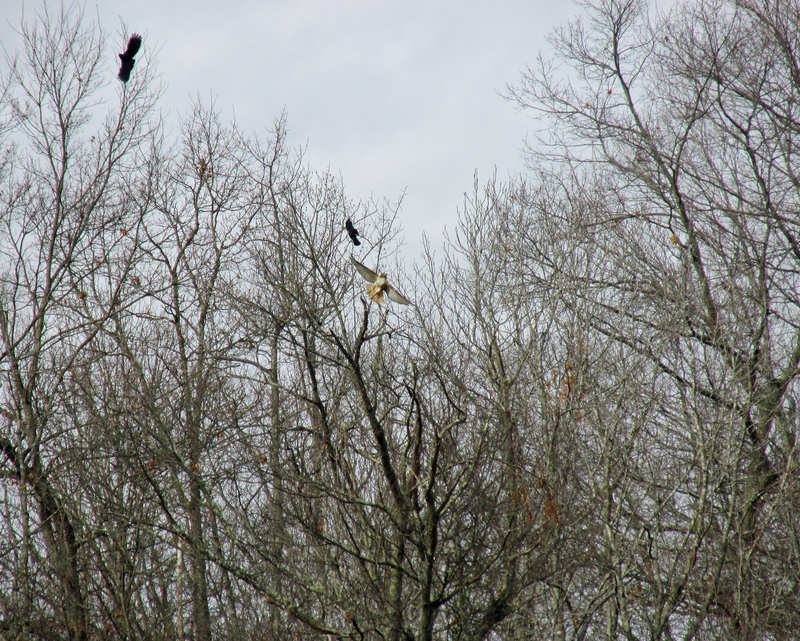 On Dec. 27, the resident flock of American Crows confronted a Red-tailed Hawk, eventually forcing the large raptor to leave it perch and depart the area. 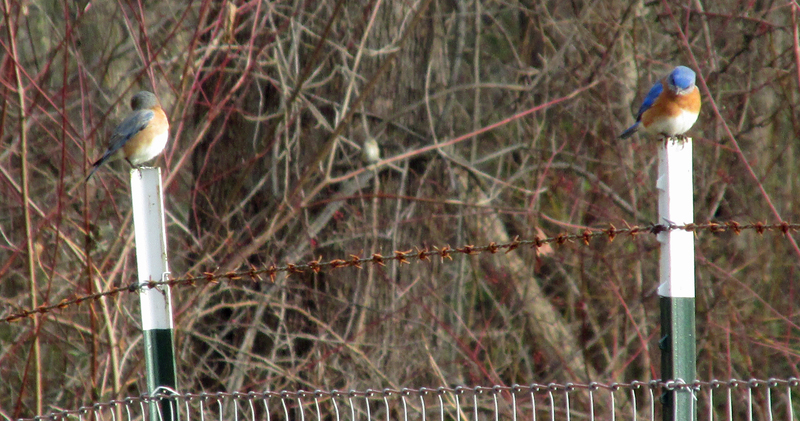 I’m hoping the Red-tailed Hawk will soon put in its first 2015 appearance. The first clue is usually a mob of angry and very vocal crows. With safety in numbers, many smaller birds will gang up on raptors to drive them away. 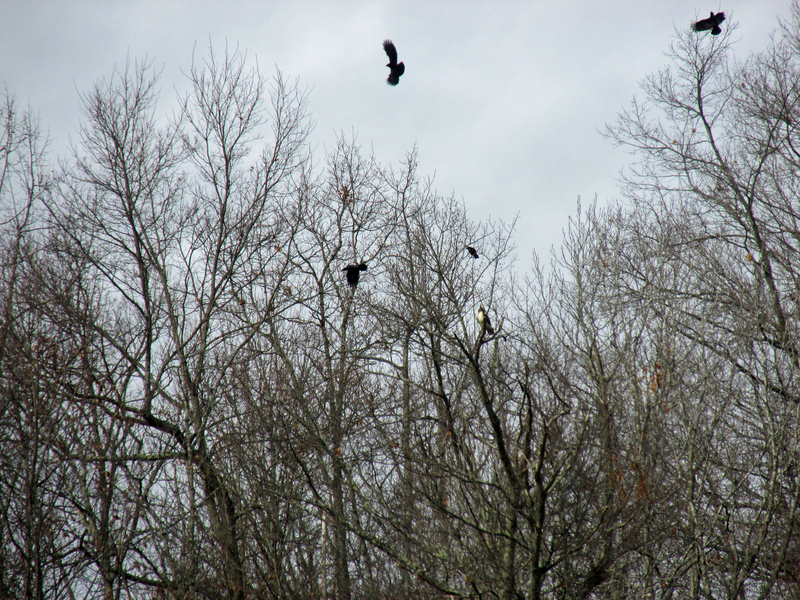 Crows can be quite merciless to both Red-tailed Hawks and any Great Horned Owls that they locate during the day. Photo by Bryan Stevens Mobbing crows force a Red-tailed Hawk to take flight from a perch in a tall tree. This entry was posted in Birding, Birds, Uncategorized and tagged Birds of Prey, Bristol Herald Courier, Carter County Compass, Elizabethton Star, Erwin Record, Hawks, Our Fine Feathered Friends, Red-tailed Hawk, Sharp-shinned Hawk, The Erwin Record on January 4, 2015 by Bryan Stevens.